My cousin Gianni Zambito joined me in The Captain’s Corner to recap last weeks NBA Draft, and also to speculate on what is to come during the NBA’s Free Agency period. Anthony Davis. Thomas Robinson. Bradley Beal. Those are just a few of the college prospects whose names will be called by NBA commissioner David Stern Thursday night during the 2012 NBA Draft. For diehard NBA fans like myself the annual draft kicks off all speculation and excitement for the upcoming season. It leads me to wonder if the arrival of Anthony Davis will immediately make New Orleans a playoff team. Does Andre Drummond materialize into Amare Stoudemire or Stromile Swift? Will the NBA style of play drastically help guys like Austin Rivers and Dion Waiters, who sometimes seemed a little out of place in college? Has Perry Jones fallen too far down the draft board? In 1985 the New York Knicks won (controversially, some say) the inaugural Draft Lottery. Their prize: “sure-thing” Georgetown center Patrick Ewing. Ewing, the reigning Naismith College Player of the Year, was being mentioned at the time in the same breath as Bill Russell and Kareem Abdul-Jabbar, so it was common knowledge that the Knicks would be using their first pick on him. If you slide down to the 11th pick in the draft, that’s where things get a little murky. Chicago and Washington selected Keith Lee and Kenny Green respectively, apparently unaware that a future Hall of Famer was sitting there waiting to be picked in his ridiculously short tie. Malone ended up being a 2 time MVP, 14 time All-Star, and the 2ndAll-Time leading scorer in NBA history, while Lee and Green combined to play in just 242 games and score a grand total of 1,379 career points. I guess I shouldn’t talk… that’s 242 more games and 1,379 more points than I will ever accumulate in the NBA. Then again, it’s 35,549 points less than The Mailman. 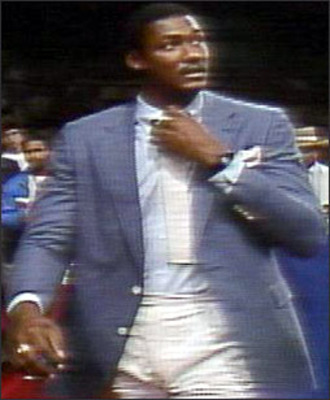 Joe Smith is best known for being an NBA journeyman who has played for 40% of the teams in the league and for being the most famous of the likely thousands of Joe Smith’s in the entire world. For most people, that’s plenty to hang your hat on but the problem is that Joe Smith was made the 1st pick of the 1995 NBA Draft by the Golden State Warriors. Smith isn’t generally considered an all-time great bust because he wasn’t a terrible player (10.9 points, 6.4 rebounds per game) and because he has the most generic name in the entire world, so most people probably don’t even remember that he was a number one draft pick. They also probably don’t remember that he was picked ahead of three much better power forwards (Antonio McDyess, Rasheed Wallace and Kevin Garnett), once again proving that drafting isn’t an exact science.The 1996 NBA Draft is widely considered one of the most talented NBA Draft classes in league history along with 1984 and 2003. The first six picks—Allen Iverson, Marcus Camby, Shareef Abdur-Rahim, Stephon Marbury, Ray Allen and Antoine Walker—all enjoyed NBA success. And late, there was value found at 13 (Kobe Bryant), 14 (Peja Stojakovic), 15 (Steve Nash), 17 (Jermaine O’Neal) and 20 (Zydrunas Ilgauskas). Those eleven players have a combined for a whopping 60 All-Star game appearances and four MVP awards. It really makes you wonder how Lorenzen Wright, Kerry Kittles, Samaki Walker, Erick Dampier, Todd Fuller and Vitaly Potapenko were picked in between Antoine Walker at six and Kobe Bryant at thirteen. Again, the NBA Draft is a total crap shoot, so there is no way to tell that Kobe Bryant would someday become one of the most talented and maniacal players in NBA history. There was no way to tell that Steve Nash would go down as an all-time great point guard. It just seems to me like someone somewhere in the front offices of an NBA team had to have a hunch that those two would be infinitely more successful than Todd Fuller and Vitaly Potapenko. Michael Olowokandi grew up in England as an athlete in track and field, cricket and rugby. It wasn’t until he was 18 years old that he started playing basketball for Pacific University by his own request. The Kandi Man tore it up at Pacific, and did just enough to sucker the poor Los Angeles Clippers into selecting him with the number one pick. I guess I don’t need to tell you that Antawn Jamison, Vince Carter, Dirk Nowitzki and Paul Pierce were all selected after the Kandi Man, and Olowokandi floundered in the league. Look, Hakeem Olajuwon is one of my favorite all-time players, and he didn’t pick up a basketball until he was 15 years old. Hakeem Olajuwon is a once in a lifetime exception to the rule that you should always feel much safer drafting guys who have lived and breathed basketball since they were young rather than guys who only started playing because they were tall. Hold on, we have a couple more examples of this poor decision making. Aleksandar Radojevic (12)- Radojevic spent most of his youth playing water polo and soccer (Shades of the Kandi Man!) Eventually, someone notified a 16 year old Radojevic that he was a giant and should probably get into a sport where he could actually utilize his height. Toronto must’ve seen shades of Hakeem Olajuwon rather than Olowokandi in Radojevic since they made Radojevic the 12th overall pick. Radojevic only played 15 games in the NBA and to my knowledge never returned to play the first sport he loved, water polo. Now I don’t claim to be an NBA expert, but I have to believe I wouldn’t pick a water polo player with the 12th pick in the NBA Draft. Wang Zhizhi (36)- It’s a little known fact that Wang Zhizhi, not Yao Ming, was the first player from China to ever play in the NBA. For some reason the only Chinese player that fans like to talk about is Yao Ming. Wait a second; I’m just remembering why that is… Wang Zhizhi stunk! My best memory of Wang Zhizhi is him always being the lowest rated player on NBA Live. Ladies and gentlemen, Wang Zhizhi! In 2001, Kwame Brown was selected before, well, everyone. Since becoming the first high school player to be selected 1st overall in the NBA Draft, Kwame has been incredibly underwhelming throughout his NBA career, becoming some sort of a walking joke and the inspiration for one of Stephen A. Smith’s best rants ever. In retrospect it was a big mistake made by Michael Jordan picking someone who according to Stephen A. Smith had small hands, and it would not the last mistake that MJ would make in the NBA Draft. Once upon a time Adam Morrison, selected third in the 2006 Draft by the MJ’s Charlotte Bobcats, was being talked about as the next Larry Bird. First of all, what the hell were we thinking? 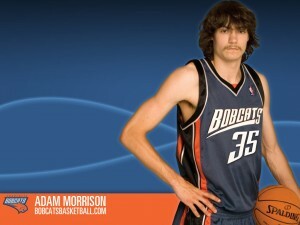 And what the hell was I thinking when I asked for (and received) an Adam Morrison Bobcats jersey as a Christmas gift? That’s not exactly $75 well spent. In the same draft Rajon Rondo fell all the way to the 21st pick. Today it seems unheard of that Adam Morrison was once considered a better pro prospect than Rajon Rondo, so I had to do some research. After scouring the internet for what scouts saw (or didn’t see) in Rondo, I found that most were worried about his decision making, size and basketball IQ. Those are legitimate concerns for a point guard, especially one without a consistent jump shot. Apparently those were the same scouts who disregarded everything that would never allow Adam Morrison to succeed in they were raving about his competitiveness, passion, basketball understanding, leadership ability, and the way he can find a way to score against better athletes. Yupp, I have that jersey. A) Thabeet started playing basketball when he was 15 years old. B) Thabeet was treated like a rag doll when he matched up with 6’7 Pittsburgh center DeJuan Blair. You could only imagine what Dwight Howard or Andrew Bynum would do to someone like Thabeet. 1: Anthony Davis will at some point be just as good as Dwight Howard, if not better. 2: Michael Kidd-Gilchrist will be the 2nd or 3rd best player on an annual playoff team. 3: San Antonio will pick a foreign player that will be starting for them in about five years. 4: Jay Bilas will say “wingspan” and “upside” at least 120 times combined throughout the course of the night. 5: Andre Drummond will be a bust and there is a ton of value to be found late, especially with guys like Darius Johnson-Odom, Quincy Acy, and Scott Machado waiting to be picked in the 2nd round. But that shouldn’t be much of a surprise. History shows us that this is the case every single year.